Home FAQs How can I spend my points? For each $10 spent 1 point will be generated. 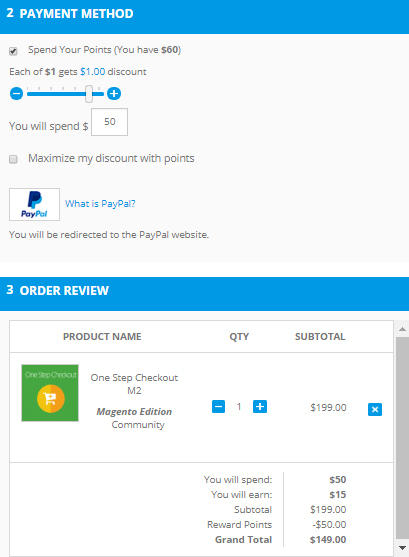 For example, for 100$ spent in Mageplaza’s module, 10 points will be added to your account. You can be able to spend both points and money in the same product. E.g You want to purchase One Step Checkout extension Community edition ($199) and you also want to spent your current 50 points to place order. Just reduce the balance point slider in the Payment Method tab. Additional trick that you can change a quantity of product to active the Ajax loading to re-apply the points adding to the total. Friendly remind that all the reward points only valid for 90 days since you’ve acquired it.